The tepee plots in this page are those for Multiple Myeloma patients in the time period from 2009 to 2015. The treatment regimens in the plots provided here have been masked and do not represent the actual regimens. The first three plots, with correct regimen labeling, will be presented as a poster at the American Society for Hematology (ASH) 2016 conference at San Diego. The fourth graphic will be published as an image in a major medical journal. Like the other three graphics, the regimen labeling presented for the fourth graphic has been jiggered and does not represent actual regimens. Each horizontal line in the first two plots represents patients entering induction during that period (read periods in the plots as in this example: Q12_2010 is the first two quarters of 2010). Each complete line represents 100% of the patients entering in that period. Using percentages with each line representing 100% gives these graphics a rectangular shape unlike other tepee presented at this website. 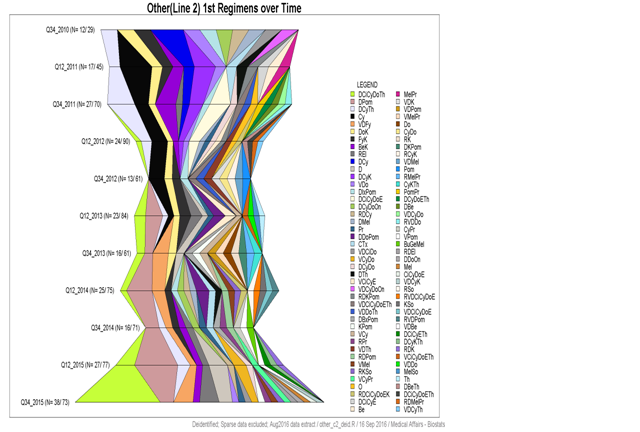 Each line is split into colored segments representing the percentages for each of the regimens in the legend. The regimens from left to right in the graphic map to the regimens from top to bottom in the legend. 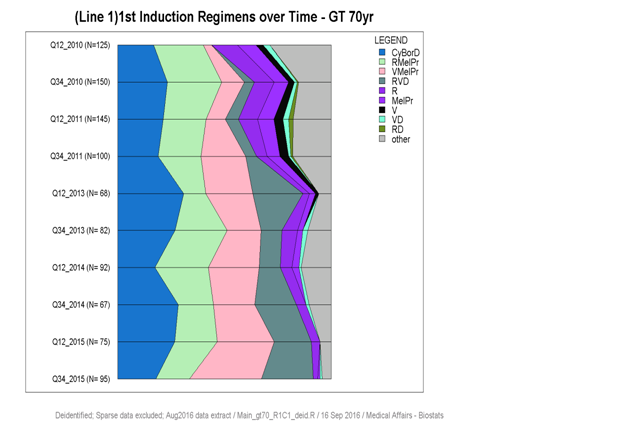 This first plot represents regimens used over time for induction for those with age greater than 70. Typically such elderly Multiple Myeloma patients are not considered for stem cell transplant therapy and are treated differently at Induction than younger patients. 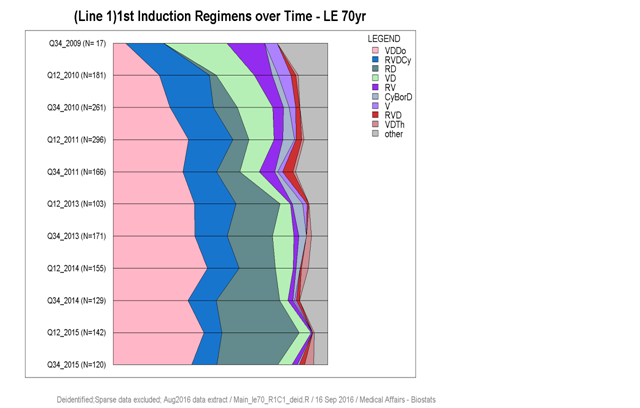 We also looked at the first induction/salvage therapy in second line. The data de-identified graphic for this follows. A good number of patients in the graphic above fall in the grey ‘other’ category and the fourth regimen de-identified graphic below visualizes the plethora of regimens given to patients in the US context. 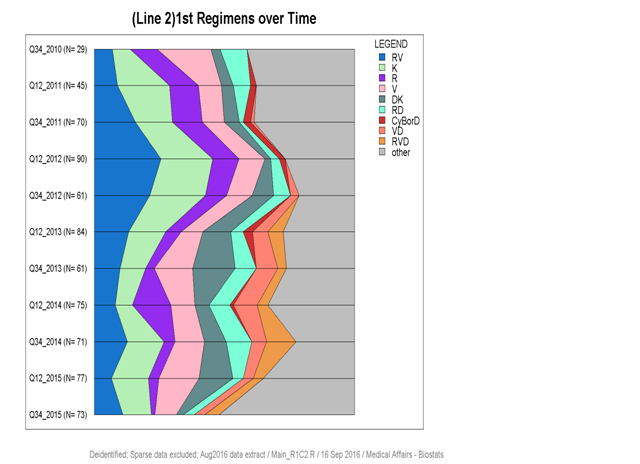 The total length of each horizontal line represents the total ‘other’ percentage in the corresponding period with segments for each regimen.